AutoPilot Chlorine Generator 60 Digital Disp. The Auto Pilot Chlorine Generator will make your life easier. FREE SHIPPING - For a Limted Time! With Microprocessor controls, digital read-out of pool water temperature, current salt level, purifier production level, Soft Reverse cell cleaning cycle and Boost Cycle, the Pool Pilot Digital is a technologically advanced unit. The easy to read digital readout on this In-Line unit even tells you how much salt to add should it run low. The Pool Pilot Digital has a patented temperature compensation feature that actually adjusts chlorine production according to the demands of the water temperature and operates in water temperatures up to104. It can purify pools up to 50,000 gallons and has a built-in time clock to control your pool pump...all at the touch of a button. Pool Pilot Digital's unique boost feature allows you to rapidly increase the level of purification, eliminating the need to shock your pool with harsh chemicals. Extra bright vacuum fluorescent digital read-out displays: Water temperature compensation, salt level, amount of salt to add, hours of cell use and water flow monitor. No More Red Eyes - Pool Pilots unique purifier production process oxidizes, or "shocks" the water to virtually eliminate the effects of high combined chlorine levels in the water. No More Itchy Skin - The pH of the purifier produced is close to your body's own pH so is more comfortable and enjoyable. No More Faded Swimwear - Steady dosage levels of purifier doesn't allow for harsh chemical environments or chlorine "Spikes" that takes days to drop to a comfortable level. Environmentally Friendly - Pure and natural salt is used to produce a fresh supply of purifier, everyday. No more hazardous chemicals to handle, obnixious fumes to smell, bleached car floor mats and clothes, or corrosive chemicals to store in your garage or shed. Automatic Cell Cleaning - Prevents scaling conditions that can prematurely wear out the cell. By periodically reversing the cell polarity, any scale development is quickly dissolved to maintain peak cell life and purifier production efficiency. No More Vacation Worries - Pool Pilot automatically produces purifier everyday, while your pump is operating, to maintain a safe and clean pool, leaving you the freedom to enjoy your vacation away from home. Energy Efficient - Pool Pilot requires very little electricity and may add as much 3 cents an hour to operate, at maximum power output. Soft, Silky Water - Adding salt to your pool will create a soft, silky water condition, making it more comfortable to swim in. Never Buy Chlorine Again - Your chlorine is produced on-site, in the same way the large manufacturers nake chlorine. 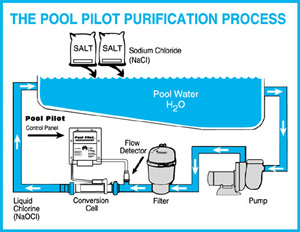 Pool Pilot uses the same technology to provide a stronger, fresher supply of purifier, but out-of-site and out-of-mind. Patented temperature compensation - Automatically adjust the output level based upon the seasonal changes in water temperatures. As the temperature increases, the output will increase up to 100% higher than the normal setting. As the temperature decreases, the output will decrease down to 1% output (at below 50F). This eliminates the need for constant adjustments to keep up with the temperature changes. More purifier output than any other unit, up to 2 lbs per day - The highest output cell in a compact size in the market! Each cell produces up to 2 lbs/day in a compact, lightweight package. Easy to service, powerful for any size pool. Multiple boost cycles, 24 & 72 hours - Two automatic Boost modes overrides the output setting to provide maximum purifier production for 24 or 72 hours, then automatically returns to the normal setting. Used when the purifier level drops low such as after heavy rainfall, large pool parties or refilling the pool. Operates at any water temperature up to 104 degrees - The microprocessor based Control unit continues to produce purifier at peak efficiency based upon temperature to provide optimum cell life. Operates at all salt level - 2,500 - 3,500 ppm - Nearly undetectible low operating salt level is safe for all salt-sensitive diets yet can also handle as high as sea water levels, and still provide that soft, silky feel. Control systems compatible - Designed to interface with electronic and chemical automation controllers. Soft reverse cell cleaning - Gently ramps-up power at polarity reversal for less "stress" on the power circuit board and cell coatings to optimize system life. Push button controls - soft push buttons are durable and comfortable to operate and adjust whenever needed. Lifetime trade-in value on cell - Long lasting cells now comes with a trade-in value when its time to replace the cell. Does the AutoPilot DIG-60 include an APK0004 Relay Kit. A Answered on 9/26/2012 by InyoPools Product Specialist Patrick P.
No, the DIG-60 does not include an APK0004 Relay Kit. Can the Auto Pilot control a pool pump and a booster pump for a cleaner? A Answered on 3/20/2009 by InyoPools Product Specialist Patrick P.
No, the Auto Pilot can control a single or dual speed pump but the booster pump would need it's own timer.